← Guess where we’ll BEE on Saturday, May 20th? 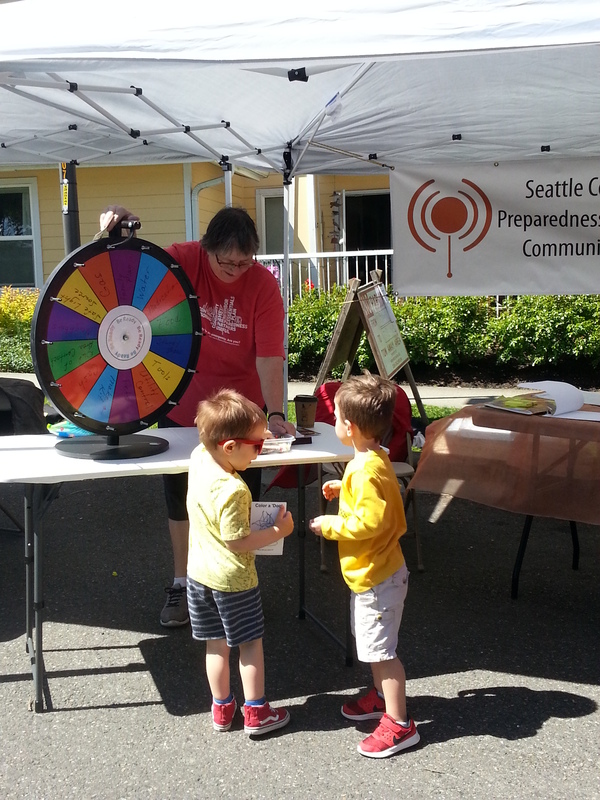 Thanks to those of you who stopped by our West Seattle Be Prepared booth at the 5th Annual West Seattle Bee Festival! It was a beautiful day for a festival, and we enjoyed bee-ing there. Following is a photo of Cindi Barker and her infamous Wheel of Misfortunes. If you missed seeing us at the Bee Festival, or if you’d like another chance at the wheel, look for us next at the Morgan Junction Festival on Saturday, June 17th from 10 AM until 5 PM. It’s a great opportunity to pick up printed informational materials, ask us questions and meet some of the West Seattle hub captains and volunteers! This entry was posted in Announcements, Events, Outreach events & festivals, West Seattle Be Prepared and tagged 5th Annual West Seattle Bee Festival, Cindi Barker, West Seattle Be Prepared, West Seattle Bee Festival 2017, Wheel of Misfortunes. Bookmark the permalink.